Does Anyone Really Borrow A Cup Of Sugar Anymore? If you live in a neighborhood where you have recently borrowed a cup of sugar, then I would consider that to be a great place, and a place that time has forgotten. Why has this neighborly gesture become a thing of the past? Most of us don’t even talk to our neighbors anymore, much less feel that we could borrow a cup of sugar from them. This strong bond and sense of community is probably gone forever. I for one will always miss it. I grew up in an older, established neighborhood, and by that I mean, we had all been there a while. We spoke daily, knew everybody’s family, and everybody’s business, and in a good way. We took care of each other. I remember as a kid, my mother, my grandmother, and my aunts, would spend all their time in the kitchen cooking for our family, and they would also cook food to share with the neighbors. When they needed an ingredient, no one ran to the store, or bought something prepared in its place. They would send me next door to borrow a cup of sugar, a stick of butter, flour, or whatever was missing in the pantry. That is just the way it was. We spent time talking with the neighbors over a cup of coffee, sharing gardening tips, sharing the days local news, and of course a sharing touch of healthy gossip. I remember my mother borrowing a stick of butter from our neighbor Barbara, to bake a cake that was going to be given to her for a holiday gift. I am sure if Barbara had known this, she would have given an obligatory eye roll, told the story over a cup of coffee, and deep down been perfectly fine with the gesture of give and take. So now all these years later, I’m still living in an old city neighborhood, much like what I grew up in. But my childhood memories are just that, childhood memories. I am lucky if I get a smile and a gentle wave from my neighbors, because in this day and age that bit of effort seems to be a lot for people to give. My neighborhood and neighbors are great, but really it is our overall society that has changed. I wonder if someone next door took the time to sit on my porch with me, drink a cup of coffee, and talk about Sundays football game, would be like telling your friends you saw Bigfoot. What we are missing by dismissing this wonderful old pastime, is connecting with another person, and growing a relationship that enriches, and strengthens who we are. Real human connection, not texts, not emails, not phone tag, gives us a way to give back, a way to give of ourselves, and a way to learn from others how we can be a better person. It gives us perspective, and wholeness. 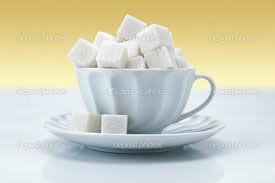 And let’s face it, we all need a cup of sugar at some point! Let’s make the effort to make the connection, and never forget how great is it to be a part of a neighborhood family!